Dr. V. Ratna Reddy is the Director, Livelihoods and Natural Resource Management Institute, Hyderabad, India. He is an Economist specializing in Environmental economics and Natural Resource Management. He is a Research Fellow of the Alexander von Humboldt foundation, Germany. He was a visiting fellow at the Institute of Development Studies, Sussex, UK and at the School of Geography, University of Leeds, UK. His current research interests include natural resources and environmental economics, livelihoods analysis and agricultural policy. He has more than hundred publications in International and Indian Journals. He has published Six books, including User Valuation of Renewable Natural Resources: The User Perspective (Nova Science publishers Inc, New York) and Managing Water Resources from Oxford University Press, New Delhi. Dr. Geoff Syme is Professor of Planning in the Centre for Planning at Edith Cowan University in Australia. Dr. Syme has 35 years of experience in social and interdisciplinary research on the effects of water management on societal outcomes. He has led large scale national and international research programs (>AUS 1.5 Mill) and has served as Research Director for CSIRO's Land and Water. He received a CSIRO medal for Research Excellence, and the Australian Water Association's Peter Hughes Water Award. He has published over 100 journal articles in a variety of disciplinary and multidisciplinary journals and is currently an Editor in Chief of the Journal of Hydrology (Elsevier). He regularly provides advice to National and International government and industry bodies. He provided substantial input to the National Water Commission's guide to incorporating ecological services into water planning. 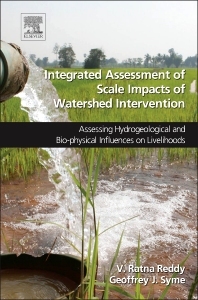 He is currently Project Leader on an ACIAR funded livelihoods based assessment of the effect of scale of Watershed Development in Andhra Pradesh, India.